These performances come out of the modules Theatre for Young Audiences, Storytelling and Performance and Independent Project. 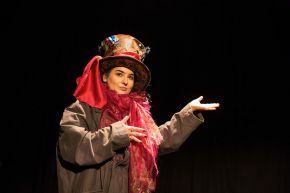 Theatre for Young Audiences The only module of its kind on the island of Ireland, Theatre for Young Audiences aims to expand students’ understanding of performance to focus on the specific demands of creating work for young audiences. It develops a range of critical and theoretical perspectives and practical skills that enhance the capabilities developed in earlier parts of the programme. The aim is to produce practitioners who can integrate theory and practice in all that they do. Storytelling and Performance This is a similarly unique research-led module that expands students’ understanding of live performance by examining the ways in which storytelling can take on a variety of performance forms. Moving from a consideration of the range of different social functions which storytelling may fulfil, the module offers students the opportunity to explore such forms both critically and through practice. Both of these modules are coordinated by Dr Tom Maguire. He teaches and researches into contemporary performance, particularly in British and Irish theatre. Tom co-edited Theatre for Young Audiences in the UK: a critical handbook (2013) and his monograph Performing Story on the Contemporary Stage was published by Palgrave MacMillan in 2015. He serves on the Board of the International Theatre for Young Audiences Research Network. Independent Project The culmination of the undergraduate programme is the Independent Project. This is the students’ opportunity to develop research interests of their own, in preparation for postgraduate study; or, as a work-based learning project. The Independent Project develops the students’ ability to work independently and to manage a project to completion. Projects are many and varied from delivering a scheme of work in a school, to developing a design concept, to writing or devising a new piece of performance work. Students negotiate the focus and outcomes of their projects and the ways in which they are assessed. The Drama staff and students are delighted to welcome Dr Susan Lynch to this year’s showcase.